For what you pay, the 710 is an excellent cleaner with a large dustbin and smart navigation systems. Its so-so battery life and long charge time are its only real letdown, otherwise it's a great match of features to price point. Robot vacs are getting better and better. Each new generation seems to be fitted with smarter sensors and fancier features to help them do their jobs more effectively. Now that's all good and everything - but it does mean that they're getting more and more expensive too. Top-end models are now well through the £500-mark and a few, like Dyson's, are even pushing a grand. The Ecovacs Deebot 710, however, is a high-specced carpet jockey without a Dyson 360 Eye-watering price tag. 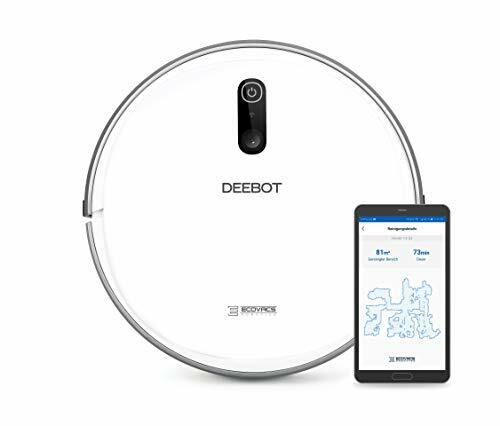 With smart navigation, obstacle detection floor mapping and a choice of power settings, the Deebot 710 seems like it's got enough to do almost any job you throw at it. So we duly decided to throw some jobs at it. Several suction sessions later, here's what we think. It's round, it's got wheels. There's no massive departure in form-factor here, nor should there be. Ecovacs tends to offer a dual-rotator brush design for its Deebots - which makes a difference, particularly if your robot vac isn't that smart. The main roller brush itself isn't very wide, so any help it can get from the rotators to drag in bits of detritus is a real bonus. It was a pleasure to watch the little thing mosey about doing just that. It meant all of our room's edges and skirtings got nice and clean no matter which way the Deebot happened to be passing. As well as bigger rollers, we've seen better ones too. The 710's is not clad in the same quality of rubber as, say, the iRobot Roombas so - although it didn't make much difference in dirt pick-up in our test - we did wonder how long the roller would last long term. Height can be a bit of a red herring with robot vacs. Sometimes you wish they were short enough to get under the furniture but, often, when they do, they get stuck on some object under the bed and end up wasting their battery getting themselves in a pickle while you're away from the house and unable to help them. For what it's worth, the Deebot 710 is about average height. Navigation is where the Deebot 710 excels. The Ecovacs Smart Navigation 2.0 system means this bot can map thanks to its edge-detection camera, while its SLAM graphics algorithms processes the images. You can't interact with these maps as you can with other models and other brands - but they do give you an accurate picture of where your bot has been on its travels and exactly what it has and hasn't been able to do. The navigation system also meant our Deebot never hurled itself down the stairs during testing. The edge-detection tech worked well enough to avoid disaster - but not so overly well that it never cleaned anywhere near top steps, as can often happen with laser barrier accessories. Just as impressive is the object detection system which employs both camera and the bot's proximity sensors on its front and side bumper. The idea is that it sees a wall or a piece of furniture coming before it bumps into it and slows down. It certainly adds a good level of peace of mind knowing that if you leave something delicate lying around by accident, it's not going to get destroyed while your Deebot goes off on its scheduled session while you're not at home to watch it. Perhaps best of all on the navigation side is how methodical this robo-vac is at sussing out your space. It likes to move up and down like a lawnmower cutting its stripes. Even without any interactive mapping and zoning, the Deebot 710 gets about very nicely and can navigate a fairly complicated floorplan without wasting time bumping into everything on the way. The only times we found the bot's systems got confused was in rooms with very dark skirtings and walls. Most rooms are not painted dark blue floor-to-ceiling - but one of our test rooms is and, while the Deebot did the job ok in there, it looked like it gave itself concussion in the process. The Deebot 710's vacuum performance is excellent on carpet. Between the three brushes it manages to pick up everything and it won't leave little fluff piles all over the place as some lesser models do. A single charge offers around 80 square metres of cleaning on standard mode, with upwards of an hour and a half of battery life. If you run it on Max, you'll get about 30 minutes and 30 sqm less and, for us, it wasn't worth the loss. What we don't like in the way of battery is that it takes over four hours to charge itself up again - which is twice as long as some of the competitors and a bit of a weakness for Ecovacs. It also doesn't restart where it left off if it has to return to the charging dock before it finishes the job. We do like the nice, big half-litre dustbin though. And the voice reporting is quite fun with its amusing updates of what it's doing; "going back to charge", "starting off", and such like. How long, we wonder, before it whistles on the job or chats to you about the weather while it works? More of the real feedback came via the app where there's plenty of space for the more critical notifications about emptying the dustbin or unjamming the brushes. As it turned out, the Deebot 710 was a lot less fussy on the getting stuck front than many of the more primadonna vacuums we've used before. It never got stuck on tricky rugs with tassles, it bested every threshold in our house, and even had enough oomph to hoike itself up a couple of tasty little steps. Spot cleaning and edge cleaning modes are also available. Spot cleaning is certainly handy if you've got a tough area to sort out. But we're not sure what Edge cleaning mode is all about, really - why clean the edges of your room and nothing else? Despite the weakness of the battery, we'd have to say that the Deebot 710 did its primary job very nicely. Its hard floor performance isn't incredible though and, sadly, it doesn't have the Ecovacs Ozmo mopping abilities. The Ecovacs app is pretty reasonable and certainly in decent working order. The Robot Messages section is where you get its status updates and some of the communicays detailing operational difficulties are very helpful. For instance, rather than just saying its not working, it'll tell you whether it's the roller, the brushes or the drive wheels, and exactly what you need to do to fix it. It could be organised a little better, and the whole look and feel could be a little more up to date, but it certainly does the job. We're very impressed with how clearly identifiable mapping is in comparison to our floorplans - down to the details of furniture and any random objects that happen to have been left out. The app allows you to scroll through all the different cartographical displays the bot has put together, along with a summary of how much floor space it managed to cover each time and how long it took. And that's useful when it comes to learning which power mode to use or any problem areas in your home where the Deebot is getting stuck. Other than that, options are fairly limited. Scheduling is good, as you would expect, with the ability to schedule multiple days, whatever times you need and the choice of putting the Deebot into Do Not Disturb mode if you'd rather it ignore its timetable. Smart home integration extends as far as Google Home and Alexa - although telling your voice assistant to get your robot vacuum to start going isn't much of a life-changer. What we found much more fun is the battery-powered remote control that comes in the box. If you can see that it's missed a spot, or you just want to drive it around like a really slow radio controlled car, then you're in. You can make it rotate, move backwards and forwards, even send it back base. Brilliant for teasing your pets. For what you pay, the Deebot 710 offers the best of robot vacuums on a fairly reasonable budget. It's an excellent cleaner with a large dustbin and its smart navigation systems make it efficient enough to cover a lot of ground every time you turn it on. Its shortcomings aren't so much in what it does do as what it doesn't. The mid-range price does not pay for interactive mapping or the creation of no-go zones, which might be something you need for your home. Although it's brilliant at getting around, it's ability to learn and remember your layout is limited. And there's no mopping skills here either. The only significant weakness is its battery life and charge time. They're somewhat mitigated by the superb Smart Navigation system, but they could be better. If you're trying to regularly care for more than about 80sqm, then without recharge and resume intelligence, the 710 is going to let you down. For most users who don't have houses that huge, however, this robot vacuum is going to be just the ticket and at just the right price too. Lots to like. Yes it's massive, yes it's expensive. And, yes, it's exceptional at cleaning - to the point it puts all other robot vacuum cleaners to dust.